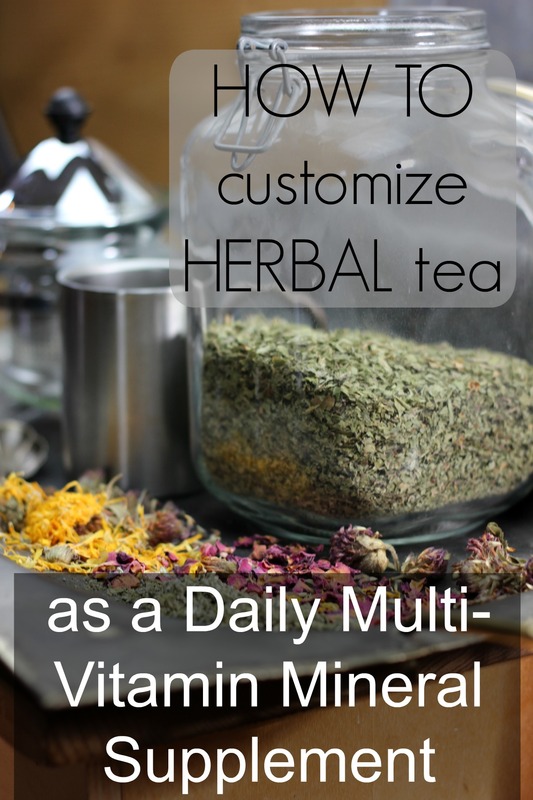 How to Customize Herbal TEA as a Daily Multi-Vitamin Mineral Supplement! Most multi-vitamin mineral supplements aren’t worth taking. Our bodies expel the majority of the synthetic nutrients, absorbing on average only 9% of the vitamins and minerals. Yet with our soils deficient, and our food therefore lacking in concentrated nutrition, what’s a good way to amend our diet? Surprisingly, the answer is herbal tea. Read more to learn how to customize a brew that will ameliorate and nourish. The roles of herbs are multitudinous. They not only balance and heal with their medicinal properties. It is less well known that herbs are concentrated in vitamins and minerals. Their nutrition is beneficial because it’s easy to assimilate. Unlike synthetic vitamins and minerals that come to us in pill form, the right co-factors are present in herbs to allow our bodies to digest and utilize their nutrition. The water of tea holds the goodness that our bodies can readily absorb and use. This post is not exhaustive, as the world of herbs is expansive and inspiring. While herbs contain many healing properties, this post focuses specifically on those herbs that are high in vitamins and minerals. For a daily blend, it may be advisable to add to these herbs additional herbs that contain the healing properties from which your body could benefit. For instance, for my daughter with a history of asthma, I add mullein leaf and lobelia to her daily blend, both herbs that are excellent for lung health. Keep in mind that vitamins and minerals are best assimilated when eaten with food, and food that includes fat. These herbal teas, therefore, are best enjoyed with your meals. Drinking the tea regularly, 3-4 servings per day, will allow the medicinal properties of the herbs to be most effective. If you’d like to incorporate these same vitamin and mineral-rich herbs into your cooking, see my You Tube video on the subject. I am not a doctor. Please consult your practitioner before beginning any new healthcare protocol. Let’s look at some universally helpful herbs and their nutrients, as well as a few customized brews that you can make at home. Alfalfa Leaf– Alfalfa is a wonderful base for tea because it aids in the assimilation of other plant elements. It is also high in Vitamins A and K, both key nutrients for overall wellness. High in chlorophyll, it’s gentle for the convalescing patient, and excellent for someone desiring stamina and strength. Dandelion Leaf– Great sources of calcium can be hard to find. Dandelion is high in calcium. It is also nutritive for the blood and helpful for anemia. It cleanses the liver and nourishes both the female organs as well as the urinary tract. It aids in digestion, and is also high in iron and Vitamin A. Dandelion is a good remedy for constipation. Ginkgo Leaf– High in calcium, iron and Vitamin C, ginkgo is also excellent for circulation and has many anti-aging properties. Ginkgo is best consumed often for optimum benefits. Milk Thistle Seed Powder– Excellent for healthy liver function, milk thistle is high in fatty acids and Vitamin E.
Peppermint Leaf– Perhaps surprisingly, peppermint is not only good for digestion. It is high in calcium, magnesium, phosphorous, iron, niacin, potassium, riboflavin, thiamine, Vitamin A, and amino acids. Peppermint also makes an excellent base with other herbs because it increases circulation and thus stimulates their absorption and the utilization of their properties. Plantain Leaf– Plantain leaves are high in beta carotene, Vitamin C, and calcium. They are also good for indigestion. Raspberry Leaf– This leaf is high in antioxidants and excellent for balancing hormones, especially in reducing estrogen dominance. It is high in calcium, iron, manganese, magnesium, niacin, selenium, Vitamin A, and Vitamin C. Raspberry leaf relieves migraines for many patients when consumed daily. Red Clover– High in chromium, calcium, magnesium, niacin, potassium, phosphorous, thiamine, and Vitamin C, this herb is also estrogenic. It, therefore, supports the production of estrogen and is best taken during the first half of a woman’s cycle. Its bitter compounds are known to reduce inflammation, improve digestion, and relieve pain. Rose Hips– Very high in Vitamin C, rose hips are also good for the circulatory system. Sage– Good for digestion, relief of inflammation and headaches, and general strengthening of the nervous system, sage is high in calcium, magnesium, potassium, thiamine, Vitamin A, and zinc. 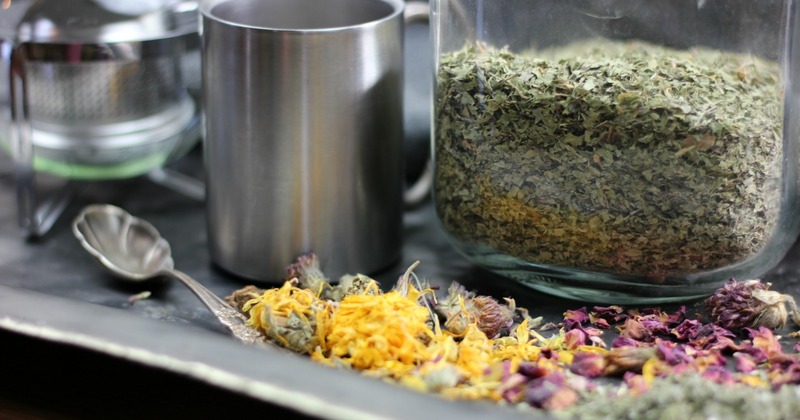 To make one of the following blends, use two parts of any herb emboldened to one part of any herb not emboldened: 1/2 cup to 1/4 cup measurements work well. Place herbs in large bowl to mix; then store in airtight container out of direct sunlight. To brew, use 1 tablespoon dried herbs to 8 ounces boiling water. Steep for 5-7 minutes; optionally, sweeten to taste, and enjoy. A larger batch can be made by using 1/2 cup tea to 1/2 gallon boiling water. Steep for up to 60 minutes, strain, and refrigerate. *While Saw Palmetto Berries do not boast particularly high levels of vitamins or minerals, they are worth noting for those who wish to customize a daily nutritive blend. Saw Palmetto Berries are excellent for men who wish to reduce an enlarged prostate. They are also good for women and children, reducing inflammation and benefiting the urinary system. They can be purchased in powdered form for use in tea. « Which Milk to Choose: Is A2 Superior? Hi Kristin, I’m sorry I can’t recommend specific herbs for your condition. Perhaps you can find a good herbalist or naturopathic physician who specializes in herbs. For purchasing rosebuds, I recommend Mountain Rose Herbs. Thank you so much for this information! There is tons of wild sage where I live, I am now going to start picking it and making tea! Sure~ the words that are written in bold text (a darker, thicker font) will be measured in twice the quantity to herbs that are not in bold text. Does that clarify enough for you? do you get all of your herbs from Mountain Rose herbs? Yes, most of our herbs. I have also ordered from Bulk Herb Store. Mountain Rose Herbs is local for me, as well as being an excellent company. herbs should be avoided while nursing? I appreciate it. Hi Lisa, I’m not in a position to guide you with safety in regard to nursing and herbs. I’m sorry. I hope you enjoy researching the topic yourself. I know it’s hard to find the time with a newborn or little one. Do you recommend equal parts for your recipes? I disagree that multi-vitamins don’t work. Sure, a lot of what you say is true, but that doesn’t really apply to every multi-vitamin or supplement out there. The supplements I take are from all whole food sources and more convenient. I do agree that our food isn’t as nutrient dense as it used to be. I really rely on my supplements to bridge the gap. I know they aren’t “useless” because of the results I have seen since using them. I love most of your articles, but will have to disagree on this one. It does not need to be either-or. The point is that MOST multivitamins are not as effective or as efficient as they claim to be. AND that herbs are powerful and a wonderful, natural alternative. I, too, use supplements. But it’s exciting that herbs can play such a key role in our daily wellness. We have come to rely on synthetic supplements. It’s a paradigm shift. Using herbs to supplement our nutritional intake is the emphasis of this post. That your multi-vitamin has been helpful to you is great, too! Thank you for this. I had no idea herbs could be so powerful. 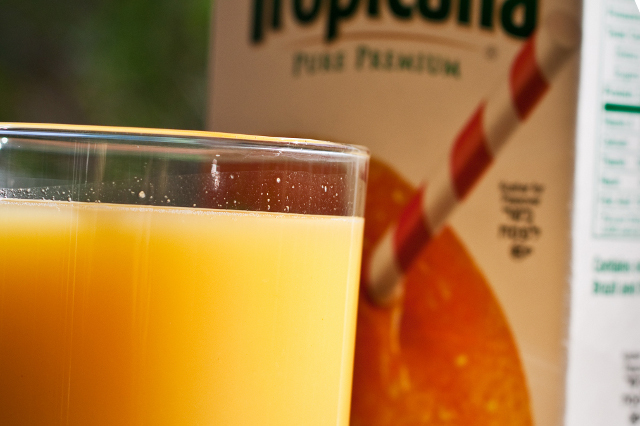 What do you drink while pregnant? I love this post! It’s so helpful! Thank you. I had a baby 9 months ago and am wanting to build my body back up, I am needing to lose extra baby weight and balance out my hormones. What good tea blend could you recommend? I am still breast feeding so I need lots of calcium. I would suggest that readers maximize vitamin extraction by doing herbal infusions versus standard tea. Depending on the herb, an infusion would take 4-8 hours or overnight. You’d also use more herb (Susun Weed’s suggestion is one ounce of dried herb per quart of water). I was just reading the same thing trying to get Vitamin C. However, regarding heat, the boiling point of Vitamin C is well above the boiling point of water. I find bell peppers for Vitamin C too expensive so I started looking to herbal teas. Does anyone know how much vitamin is released over time (percentage or absolute value) from brewing? Say, if a herb had 200 mg vitamin C in 100 g, if I brewed it for 2 hours, how much of that 200 mg vitamin C will come out of it? I am also considering liquid extracts. I took milk thistle liquid extract; it is stored in a dark bottle and I just pipette to cold water to drink. I wonder if making cold brew with these herbs as liquid extracts would be better in terms of preserving the vitamins and their functions.